Some finished objects and some new yarns. I really like the blues, grays and rusts. 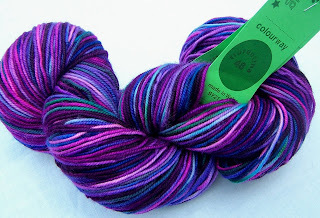 I already blogged about a really icky surprise ball from Ram Wools. It was in oranges, beige and browns. And I guess I can eat my words. The yarn is actually quite nice and I am starting to like the colours. I still don't like the price (with shipping it was almost $25...books were out of stock). 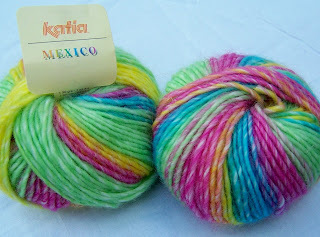 This yarn was 100g for $15. I can live with that price for a pair of plain vanilla socks. Now this one was a bit weird. I had all intentions of making this into mittens for Kelly but I knit 1 mitten up and it had really wide stripes, some almost 2 inches long. I started the other mitten with the other ball (didn't necessarily want them to be exact but at least fraternal). Stripes turned out to be narrow, none more than 2 rows wide. Now that isn't even close to fraternal as far as I'm concerned. Should have taken pics before I ripped them out in disgust. So now it's back in the stash bins. I'm not sure what I will do with it yet. 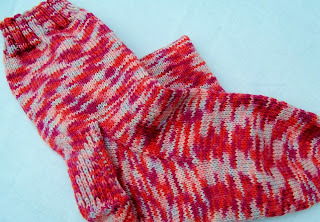 Maybe I'll try a toddler hat and mittens, something that I can use the wide and narrow striping on. Bought at a close out sale and of course, no refunds. Variegated. 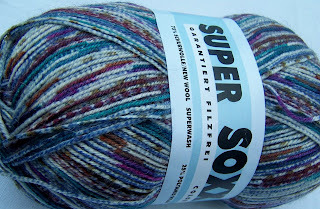 I'm sorry but I like this yarn and this colour. 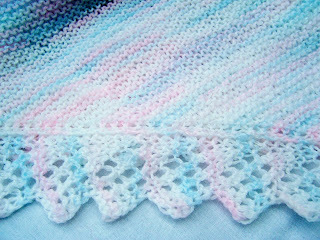 I had another scarf that I had done in Tunisian Crochet years ago that I really liked. When I found a couple of leftover balls in my stash, I just knew that I need to make another one. Found this pattern to show off the variegation. This blanket started out as one from the Classic Elite website. 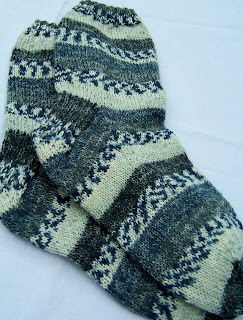 The pattern is no longer there (I emailed them, the yarn was discontinued). It was originally done in 2 colours, alternating stripes. I had a bunch of leftover Briggs and Little 2 ply wool that I wanted to use up. I wasn't fussy about the feel of this yarn for hats and socks and mittens. I know a lot of people like it but it felt coarse to me. So I randomly striped everything I wanted to get rid of. It was just 50 stitches on size 8mm needles. A 4' icord was also made for the roll tie. I knitted everything I had and wound up with about 24" x 65". Felted it came out a perfect seat size. 18" x 48". Just right for 2 people on a cold bench. 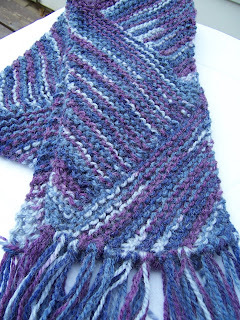 I love simple garter stitch for watching hockey games or driving in the car and this pattern fit the bill. I used 4 balls of Bernat Lollipop Ombre Col #3088, that I had bought at a closeout sale at Lens Mills. 3.5mm needles. 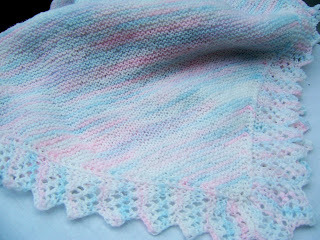 The lace edging was to be knit and then sewn on, but I dislike seaming. Pick up stitches all the way around blanket. And then attach one live blanket stitch to each edging stitch. I think I actually did 1 live blanket stitch to 1 row edging, then 2 live blanket stitches to 1 edging so it would lay flatter. As it got closer to the corners, I did a few short rows to get 1 extra repeat on each side of the corner and make it lay flat as it turned. Not sure if this makes sense. Some "Fancy Free" from my stash. Just basic thick warm socks. I love this Kroy for my arena socks. It's really warm without it being boot socks. And thin enough to fit in my shoes or Berks. Done with Opal handpainted using a picot edge. 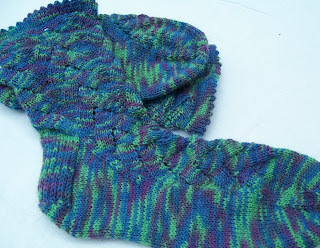 'Nuther basic boring sock to give away for Christmas. It actually looks nicer in real life. The blacks and blues will make nice jean socks. I think I will have to relook at my sock stash totals. If the average ball is 100g, this says I have 52 pairs worth. No way do I have that much sock yarn in 2 boxes. So back to recheck my totals.